Seasplash [img]http://flightrising.com/rendern/350/481711/48171086_350.png[/img] Ashghost [img]http://flightrising.com/rendern/350/415549/41554865_350.png[/img] Harper [img]http://flightrising.com/rendern/350/420334/42033349_350.png[/img] Harper was taking deep breaths after what happened, being attacked by Kaleena, who’s usually cool and emotionless, then the sudden appearance of the starry Nocturne. Ashghost was the ‘leader’ of the trio by default as the eldest and was trying to calm Harper down too, while never taking eyes off the once giggling (and creepy) Nocturne in front of them. Seasplash was thinking and considering options about who could be the dragon the mimic ‘bonded’ to. The Clan Lair had fallen at the Clan Nocturne’s very claws. There are quite a lot of Nocturnes, including Kaleena, and the first one who seemed to have been noticably affected was Kaleena’s nephew Shiho. Who knows what happened to the eggs they had in the hatchery! They had to end this mimic’s reign of terror! “Any ideas there Seasplash? We could really use one.” Ashghost gulped, satisfied with how calm Harper was now (he was pale-faced and sweaty but that wasn’t as bad as before). “Who last left the Lair? Might be them. Or who collects the most ‘valuables’?” She was trying to prompt some ideas, but this only got her an even louder ‘Hmm...’. “Someone might wanna check on Skylar if it’s trinket gathering.” “But Skylar was affected by the mimic like every other Nocturne! Not her.” “Maybe it’s one of US? !” Harper and Ashghost facepalmed. “Nope. Not one of us. Then... maybe on Riveros? She’s always looking around for stuff to sell, familiars, trinkets and gadgets for Kaito to mess with... KAITO! Of COURSE! He tampers with things, maybe the mimic didn’t get to effect Riveros but it got to Kaito instead!” “That’s a plan! Great thinking Seasplash, are you SURE your not related to Cerulean? He is the resident options and ideas expert.” Ashghost grinned, giving him a pat on the back that seemed more like a shove (she is bigger and Seasplash is way younger). ———— And it seems he was right! It was Kaito indeed who the mimic bonded to. He, or the mimic, had set up traps all over his Laboratory! Amber-sap buckets that solidified on contact, quicksand, falling pits, explosives, needles and arrows tipped/filled with some liquid they knew they shouldn’t have in their bloodstreams, and it seems the mimic had hidden itself as Kaito’s new cauldron! It attacked them, but being closest to Harper, who wore an almost full set of armour (the tail wasn’t protected), he attacked him again and the easily scared Skydancer shrieked and slammed into an empty, smaller cauldron with amber sap and the mimic was trapped inside it. “Wow, didn’t he know the trappers trap can trap the trapper? As that crazy person or dragon once said?” Seasplash smirked. Harper and Ashghost were clueless to what he was talking about. “Nevermind!” He yowled as Kaito sprang right at him, striking at a vital spot that was covered in gembond scales. He recoiled in pain. “Harper hold him down! Shouldn’t be THAT hard! He’s the smallest dragon in the Clan! I think.” Ashghost said, turning to the cauldron. “How do we defeat a mimic?” She says, just ‘accidentally’ destroying the cauldron. “Umm... was I supposed to do that?” Even if it wasn’t, thank the eleven that Riveros herself showed up and took care of the mimic for good. The Clan suffered many injuries and a lot of damage... but hey! It’s the Twisting Crescendo, where wild winds could tear their Lair apart any day... they would recover from this, just a few angry mothers to deal with and a SAFE new cauldron for Kaito’s potions. The eggs were also recovered in a safe and healthy condition! Harper was taking deep breaths after what happened, being attacked by Kaleena, who’s usually cool and emotionless, then the sudden appearance of the starry Nocturne. Ashghost was the ‘leader’ of the trio by default as the eldest and was trying to calm Harper down too, while never taking eyes off the once giggling (and creepy) Nocturne in front of them. Seasplash was thinking and considering options about who could be the dragon the mimic ‘bonded’ to. The Clan Lair had fallen at the Clan Nocturne’s very claws. There are quite a lot of Nocturnes, including Kaleena, and the first one who seemed to have been noticably affected was Kaleena’s nephew Shiho. Who knows what happened to the eggs they had in the hatchery! They had to end this mimic’s reign of terror! “Any ideas there Seasplash? We could really use one.” Ashghost gulped, satisfied with how calm Harper was now (he was pale-faced and sweaty but that wasn’t as bad as before). “Who last left the Lair? Might be them. Or who collects the most ‘valuables’?” She was trying to prompt some ideas, but this only got her an even louder ‘Hmm...’. “That’s a plan! Great thinking Seasplash, are you SURE your not related to Cerulean? He is the resident options and ideas expert.” Ashghost grinned, giving him a pat on the back that seemed more like a shove (she is bigger and Seasplash is way younger). And it seems he was right! It was Kaito indeed who the mimic bonded to. He, or the mimic, had set up traps all over his Laboratory! Amber-sap buckets that solidified on contact, quicksand, falling pits, explosives, needles and arrows tipped/filled with some liquid they knew they shouldn’t have in their bloodstreams, and it seems the mimic had hidden itself as Kaito’s new cauldron! It attacked them, but being closest to Harper, who wore an almost full set of armour (the tail wasn’t protected), he attacked him again and the easily scared Skydancer shrieked and slammed into an empty, smaller cauldron with amber sap and the mimic was trapped inside it. “Wow, didn’t he know the trappers trap can trap the trapper? As that crazy person or dragon once said?” Seasplash smirked. Harper and Ashghost were clueless to what he was talking about. “Nevermind!” He yowled as Kaito sprang right at him, striking at a vital spot that was covered in gembond scales. He recoiled in pain. She says, just ‘accidentally’ destroying the cauldron. “Umm... was I supposed to do that?” Even if it wasn’t, thank the eleven that Riveros herself showed up and took care of the mimic for good. The Clan suffered many injuries and a lot of damage... but hey! It’s the Twisting Crescendo, where wild winds could tear their Lair apart any day... they would recover from this, just a few angry mothers to deal with and a SAFE new cauldron for Kaito’s potions. The eggs were also recovered in a safe and healthy condition! 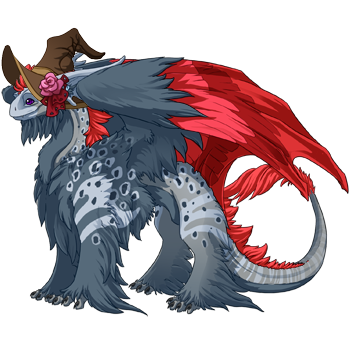 [left][url=http://flightrising.com/main.php?dragon=38314440] [img]http://flightrising.com/rendern/350/383145/38314440_350.png[/img] [/url][/left] Shateiel was the one that moved first, daintily stepping over the fallen Nocturne. „Did I not tell you that we should not open our lair to the Nocturnes? Did I not tell you of the danger I foresaw?“, the Skydancer called to her companions scathingly, her eyes narrowed to slits and all Darach could think about was what a shame it was, that Shateiel could have been quite beautiful if her face had not been contorted in a sneer. 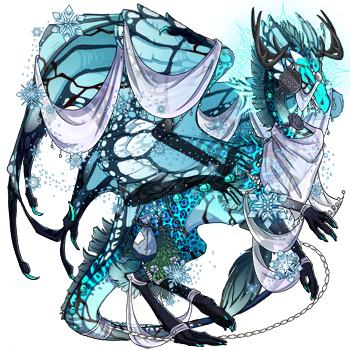 Such a graceful dragon full of disdain and coldness. „Stop staring and move, you fool, if we stay, we could also just invite these mad creatures to slay as where we stand. Do you want that?“, she spat at the young Pearlcatcher and turned to the opening of the cave, her steps sure and controlled. She mumbled something under her breath but Darach could not make it out over the roaring of the waves outside. „She called us all narrow-minded fools, she is very angry“, a cackling voice sounded right next to his ear and Darach stumbled with a surprised yelp. The cackling grew louder. „Did you really have to do that?“, Darach mumbled embarrassed and gripped his pearl tighter. The creature next to him, and Darach really wished he would not know how to read the expression of a skull, pouted. He had the size and the build of a Pearlcatcher, if Pearlcatcher had hound skulls and eery wisps dancing in their manes, and mist was spilling forth from their maw. Simeon. 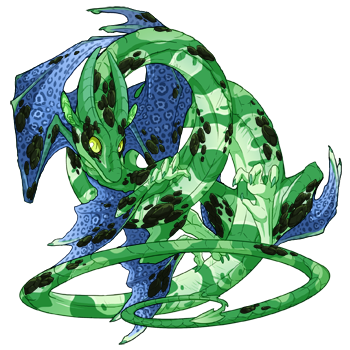 [right][url=http://flightrising.com/main.php?dragon=39172032] [img]http://flightrising.com/rendern/350/391721/39172032_350.png[/img] [/url][/right] „Why narrow-minded?“, Darach frowned and stepped outside. Wet sand clung to his claws and the waves clashed against the high cliffs surrounding the beach. The moon shone weakly behind a thick band of clouds. Shateiel was already further down the beach, actually turning further away from the lair hidden in the cliffs. „Because most don’t take note of her prophecies. Which is dumb because Shateiel is actually a pretty good seer, gifted with many eyes that see as many futures at any time. She does not take lightly to fools who spurn her warnings and she has been crying fool for a long time.“, Simeon appeared at his shoulder and his eery appearance lit up the beach, wisps falling from his mane and dancing in the air before coming together again to sit where a normal Pearlcatcher’s mane would have been. Darach stared. It was a bit like someone had tried to built a Pearlcatcher and Wraith Hound but had forgotten halfway through how each one actually looked like and ended up with Simeon. He had not thought that he would actually be glad to see him one day. „But why is Shateiel in that direction? There is only the hidden path up the cliffs and the rocky domain that it leads to there?“, Darach was stumped, didn’t Shadowsong say that a Mimic had bound itself to a member of their clan? Tho he was not sure how any of members of the clan could fall prey to such a creature, theirs was a clan of outcasts and otherworldly beings that had emerged after the great Shifting of the Elements. 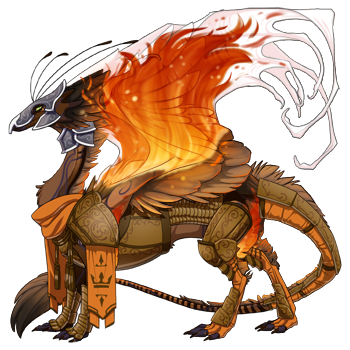 „Because“, and Simeon grinned at him widely before bounding after Shateiel, „[url=http://flightrising.com/main.php?p=lair&id=49477&tab=dragon&did=35958636]Psyche[/url] lives there!“ Darach stared after them, Simeon’s glowing wisps and Shateiel’s white silks fluttering in the wind. Then he followed. They made a weird group like that, Shateiel first with her elegant dressing and the shadowy arms nearly hidden beneath. The ghostly arms appearing at odd intervals were much more remarkable all together, their color nearly matching Simeon’s glowing fires. Simeon with his ghastly appearance and him, one of the youngest of the clan and with no special abilities to tell of. He was no sybil or ghost, no watcher or warrior. He loved animals and the nature and warm days with a bright sun. But he had been left for death and without the Leviathan Sanctuary he would, actually, be dead so he supposed that this was what he would have to do to pay his debt back. Although there was one thing…? „Who is Psyche?“, he asked out of the blue and his companions stopped before turning to him with an incredulous face. Even Simeon, with his ever present grin nearly lost his lower jar before Shateiel pushed it back into place. „Psyche is, hm“, she stopped and thought for a moment, „different.“ „She is an abomination“, was Simeon’s blunt verdict and Darach bit his tongue keeping in his shout of, well, what are you then, Simeon? He figured that he would not appreciate something like that right now. „Yes, quite, thank you Simeon“, Shateiel pushed Simeon down like a dog and stepped up to Darach, grabbing his head with all six of her arms. The Pearlcatcher really wanted her to stop doing that. „Listen, child,“ Darach made a face at that, „Psyche is what we call a spirit, a malevolent one, created out of the leftover energy of an abandoned hatchling. She thrives from death and hate and it’s all that she knows. We will find her somewhere hidden between the rocks and she will look like a Skydancer, a pretty red and purple Skydancer, and she will be kind, oh will she be kind, honeyed words that will lull you. Listen more carefully and you will hear the grating growl behind her soothing tone, the song of hate and agony hidden behind each vowel from her maw.“ Darach gulped and cowered before Shateiel. He was no warrior, not brave or strong. Flowers, he loved flowers, but flowers can be crushed and torn apart by sharp teeth and claws. „She will have bound the Mimic to herself and waited for the annual passing of the Nocturnes, there are always some staying with us each year before carrying on to their home. Wherever that is“, Simeon scratched his chin with a sharp claw and mused on that while Shateiel rolled her eyes, an impressive sight with all of them running down her lithe body, and nudged him up again. „Most likely, Psyche is driven like that“, she acknowledged and led them further up. Darach wavered for a moment, longing for his pretty flowers and the soft grass filling up his nest. But there would be no nest to return to if they did not do this and so he took a deep breath and hurried after his clan mates. Somehow it felt a bit like doom. [center][url=http://flightrising.com/main.php?dragon=38223157] [img]http://flightrising.com/rendern/350/382232/38223157_350.png[/img] [/url][/center] [center][columns][item=Snarling Mimic][color=transparent]_______________________ [nextcol][color=transparent]_______________________[url=http://flightrising.com/main.php?p=lair&id=49477&tab=dragon&did=35958636][img]http://flightrising.com/rendern/coliseum/portraits/359587/35958636.png[/img][/url][/columns][/center] Later, much later, when the Nocturnes left and Darach stared after them, he sometimes wondered if he just dreamed all of it up, that night on the cliffs, when Shateiel had neatly broken Psyche's neck only to see her rise up again, a snarling Wraith rushing them and the howl of hounds surrounding them. It had been Simeon and his pack of hounds that wrestled with the angry spirit, spitting howling insults at them when they ignored her honeyed words. It was utter chaos and Darach had crawled along the battleground between the jagged rocks and had searched for the Mimic, quite literally stumbling over it. It was a pitiful thing, pale and quivering, and Darach had not been able to stop himself. it had been hilarious to see Psyche going down when the Mimic she had bound locked itself around her legs and crushed them, and Shateiel had reacted instantly, severing the connection between spirit and Mimic before hurling some glimmering herbs at the angry spirit and making a run for it with the happily panting Mimic slung under one arm. She had pushed the thing at Darach as soon as she could, cold arms grabbing both him and his new burden, and a happily lolling Simeon before stomping her way back to the lair. Psyche had been lying on the ground, the herbs burning by then and thick smelling smoke filling the air, making Darach sleepy. Shateiel had went back to her little cove, angrily muttering and throwing other herbs into a big bowl, rounding on Darach when he made a sound and pointing, with all of her arms, at the opening of her cave until he left. Simeon had laughed at him, grinning widely and then he was gone, only a few wisps left to mark where he had stood before. And Darach had been left there on the beach, a happy Mimic sitting before him and had wondered what to do with it now. "Flowers", he had stated, staring at the monstrous creature before him, "flowers solve anything." Wit that, he pulled off one of his many flowers chains and threw it over his companion before trotting back into the lair and lying down on his soft bed of grass. The Mimic settled down next to him and in the warm light of his candles, it actually looked less monstrous then he had thought. Although the flowers helped, he acknowledged, before blowing out the candles. Shateiel was the one that moved first, daintily stepping over the fallen Nocturne. „Did I not tell you that we should not open our lair to the Nocturnes? Did I not tell you of the danger I foresaw?“, the Skydancer called to her companions scathingly, her eyes narrowed to slits and all Darach could think about was what a shame it was, that Shateiel could have been quite beautiful if her face had not been contorted in a sneer. 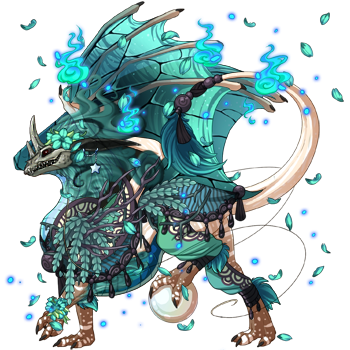 Such a graceful dragon full of disdain and coldness. „Stop staring and move, you fool, if we stay, we could also just invite these mad creatures to slay as where we stand. Do you want that?“, she spat at the young Pearlcatcher and turned to the opening of the cave, her steps sure and controlled. She mumbled something under her breath but Darach could not make it out over the roaring of the waves outside. „She called us all narrow-minded fools, she is very angry“, a cackling voice sounded right next to his ear and Darach stumbled with a surprised yelp. The cackling grew louder. „Did you really have to do that?“, Darach mumbled embarrassed and gripped his pearl tighter. The creature next to him, and Darach really wished he would not know how to read the expression of a skull, pouted. He had the size and the build of a Pearlcatcher, if Pearlcatcher had hound skulls and eery wisps dancing in their manes, and mist was spilling forth from their maw. Simeon. „Why narrow-minded?“, Darach frowned and stepped outside. Wet sand clung to his claws and the waves clashed against the high cliffs surrounding the beach. The moon shone weakly behind a thick band of clouds. Shateiel was already further down the beach, actually turning further away from the lair hidden in the cliffs. „Because most don’t take note of her prophecies. Which is dumb because Shateiel is actually a pretty good seer, gifted with many eyes that see as many futures at any time. She does not take lightly to fools who spurn her warnings and she has been crying fool for a long time.“, Simeon appeared at his shoulder and his eery appearance lit up the beach, wisps falling from his mane and dancing in the air before coming together again to sit where a normal Pearlcatcher’s mane would have been. Darach stared. It was a bit like someone had tried to built a Pearlcatcher and Wraith Hound but had forgotten halfway through how each one actually looked like and ended up with Simeon. He had not thought that he would actually be glad to see him one day. „But why is Shateiel in that direction? There is only the hidden path up the cliffs and the rocky domain that it leads to there?“, Darach was stumped, didn’t Shadowsong say that a Mimic had bound itself to a member of their clan? Tho he was not sure how any of members of the clan could fall prey to such a creature, theirs was a clan of outcasts and otherworldly beings that had emerged after the great Shifting of the Elements. „Because“, and Simeon grinned at him widely before bounding after Shateiel, „Psyche lives there!“ Darach stared after them, Simeon’s glowing wisps and Shateiel’s white silks fluttering in the wind. Then he followed. They made a weird group like that, Shateiel first with her elegant dressing and the shadowy arms nearly hidden beneath. The ghostly arms appearing at odd intervals were much more remarkable all together, their color nearly matching Simeon’s glowing fires. Simeon with his ghastly appearance and him, one of the youngest of the clan and with no special abilities to tell of. He was no sybil or ghost, no watcher or warrior. He loved animals and the nature and warm days with a bright sun. But he had been left for death and without the Leviathan Sanctuary he would, actually, be dead so he supposed that this was what he would have to do to pay his debt back. Although there was one thing…? „Who is Psyche?“, he asked out of the blue and his companions stopped before turning to him with an incredulous face. Even Simeon, with his ever present grin nearly lost his lower jar before Shateiel pushed it back into place. „She is an abomination“, was Simeon’s blunt verdict and Darach bit his tongue keeping in his shout of, well, what are you then, Simeon? He figured that he would not appreciate something like that right now. „Yes, quite, thank you Simeon“, Shateiel pushed Simeon down like a dog and stepped up to Darach, grabbing his head with all six of her arms. The Pearlcatcher really wanted her to stop doing that. Darach gulped and cowered before Shateiel. He was no warrior, not brave or strong. Flowers, he loved flowers, but flowers can be crushed and torn apart by sharp teeth and claws. „She will have bound the Mimic to herself and waited for the annual passing of the Nocturnes, there are always some staying with us each year before carrying on to their home. Wherever that is“, Simeon scratched his chin with a sharp claw and mused on that while Shateiel rolled her eyes, an impressive sight with all of them running down her lithe body, and nudged him up again. „Most likely, Psyche is driven like that“, she acknowledged and led them further up. Darach wavered for a moment, longing for his pretty flowers and the soft grass filling up his nest. But there would be no nest to return to if they did not do this and so he took a deep breath and hurried after his clan mates. Somehow it felt a bit like doom. Yikes! That was the worst present ever! Later, much later, when the Nocturnes left and Darach stared after them, he sometimes wondered if he just dreamed all of it up, that night on the cliffs, when Shateiel had neatly broken Psyche's neck only to see her rise up again, a snarling Wraith rushing them and the howl of hounds surrounding them. It had been Simeon and his pack of hounds that wrestled with the angry spirit, spitting howling insults at them when they ignored her honeyed words. It was utter chaos and Darach had crawled along the battleground between the jagged rocks and had searched for the Mimic, quite literally stumbling over it. It was a pitiful thing, pale and quivering, and Darach had not been able to stop himself. it had been hilarious to see Psyche going down when the Mimic she had bound locked itself around her legs and crushed them, and Shateiel had reacted instantly, severing the connection between spirit and Mimic before hurling some glimmering herbs at the angry spirit and making a run for it with the happily panting Mimic slung under one arm. She had pushed the thing at Darach as soon as she could, cold arms grabbing both him and his new burden, and a happily lolling Simeon before stomping her way back to the lair. Psyche had been lying on the ground, the herbs burning by then and thick smelling smoke filling the air, making Darach sleepy. Shateiel had went back to her little cove, angrily muttering and throwing other herbs into a big bowl, rounding on Darach when he made a sound and pointing, with all of her arms, at the opening of her cave until he left. Simeon had laughed at him, grinning widely and then he was gone, only a few wisps left to mark where he had stood before. And Darach had been left there on the beach, a happy Mimic sitting before him and had wondered what to do with it now. "Flowers", he had stated, staring at the monstrous creature before him, "flowers solve anything." Wit that, he pulled off one of his many flowers chains and threw it over his companion before trotting back into the lair and lying down on his soft bed of grass. The Mimic settled down next to him and in the warm light of his candles, it actually looked less monstrous then he had thought. Although the flowers helped, he acknowledged, before blowing out the candles.